He was left without water and locked in a hot car while his owner was nowhere to be seen. 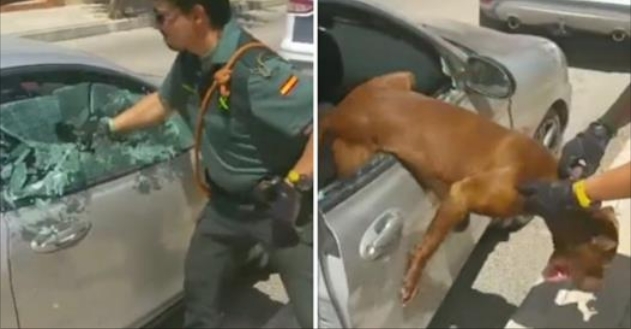 When they noticed the poor dog, police officers were forced to smash open the vehicle’s windows to stop the animal suffocating in the heat. It is not clear how long the dog had been left in the car. Footage has been released which shows an officer using a tool to smash the window open on the driver’s side. The gasping dog immediately launches out of the window, completely unaware of the glass around him, as he desperately tries to escape. Officers then gave him some water, which he quickly laps up. The pooch is then seen looking around in shock. NOTE: Every year, dogs suffer and die when their guardians make the mistake of leaving them in a parked car—even for “just a minute”—while they run an errand. Responses to "Police Smash Window To Save Dog From Dying In Overheated Car"
People that leave living things locked inside cars should be imprisoned, its the cruelest most horrible way to die, slowing being cooked. There is NO EXCUSE! Hope that the owner of this sweety, got a big fine. They can affort a big fine, look at type of the car... And that this sweet dog got other owners, who can be responsible for other living beings. Owner should be charged with animal abuse. Poor dog could have died without intervention.